The Windows operating system does not offer that many customization options natively. While you can modify the background image and color scheme, that is about as far as it goes, especially since Microsoft decided to retire the whole sidebar feature in Windows 8. If you want additional options, you either unlock theme files on the system so that you can install third party themes that can modify additional screen elements, or use a third party software like Rainmeter instead. Rainmeter has been updated to version 3.0 today. If you have a previous version installed on your system you can simply install the new one over it to upgrade to it. Probably the biggest change in the new version is the switch from GDI+ display rendering to Direct2D rendering, which should improve the font rendering noticeably. It needs to be noted that Direct2D will only be used on Windows 7 or newer versions of Windows -- provided that the latest updates are installed on it -- and that the application will fall back to using GDI+ on non-supported systems. Tip: You can check under Manage Rainmeter > Settings whether Direct2D rendering is enabled. As far as other changes go, the release notes list the most important ones. The changes are mostly important to developers and theme designers, and not for end users. While end users will benefit from support in the long run, there is likely nothing listed here that they will get too excited about. The first thing that you may want to do after installation is pick a skin that you'd like to use. A skin basically is a collection of tools and design modifications that you install on your desktop. A good getting started page is the Discover page on the official Rainmeter website. Here you find three direct download links of skins that you can get started with, and web resources that offer hundreds of additional skin downloads. You can install as many skins as you want, and switch between the installed ones using the System Tray icon of Rainmeter. Here you can also enable or disable modules that you want displayed or hide on the screen. Note that many skins display only select modules by default, and that you need to use the menu to display additional ones it makes available. Note that you may need to load wallpapers and skin items manually, depending on how the skin pack is being made available. You find the installed skins and their files, including wallpapers and such, under My Documents/Rainmeter/ on your system. If you like to customize your computer, and especially like the idea of gadgets or widgets being displayed on your desktop at all times, then you will certainly find Rainmeter appealing. 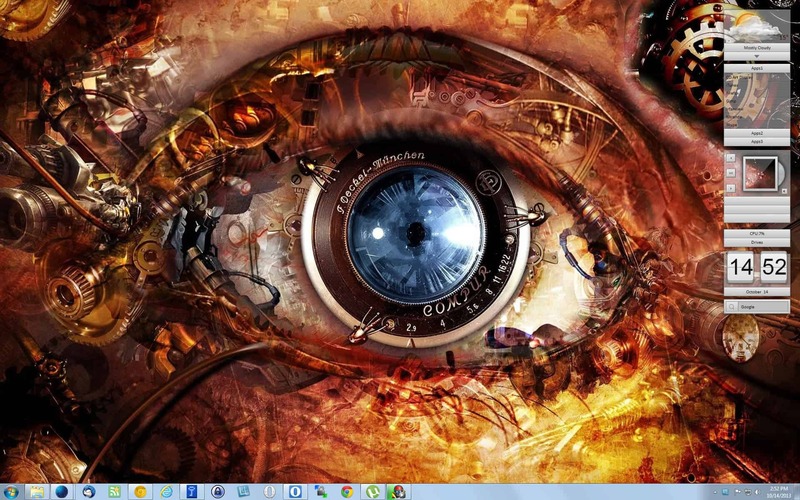 Love to customize my desktop and looks like this one will definitely help me create cool looking desktop backgrounds.. Checking the site now. This tool get rid of .NET Framework from this version. It’s now accepted as portable app.